Emily is an experienced skipper, ocean advocate and artist who is dedicated to exploring the huge environmental challenges we face, in particular ocean plastics. Northwest Passage and worked on a sailing cargo ship trading western supplies for coconuts. Emily now splits her time between running eXXpedition – a series of all female voyages focusing on plastic pollution and female health – and working on solving the ocean plastics issue with Parley for the Oceans and other corporate clients. At the heart of Emily’s work is a mission to inspire and facilitate a community of changemakers. She runs workshops and programs that encourage us to rethink everything we do from the social and environmental challenges we face, to happiness, efficiency, values, mass-consumption and more. Emily has followed her passion in life, not a pre-set career path, and as such she is an inspiration to all who desire the same for their lives. 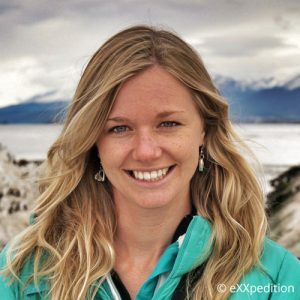 An experienced public speaker, Emily has spoken around the world at TEDx conferences, universities and global companies, sharing both her adventures and an understanding of the issues relating to our oceans, human mindset and future society. Last year she addressed Presidents, Prime Ministers, Fisheries & Climate Ministers from around the globe at the United Nations General Assembly ‘Sustainable Oceans and the Blue Economy’ event. Emily was honoured with the Fitzroy Award at the 2016 Ocean Awards and is also the youngest and only female recipient of both the Yachtmaster of the Year, awarded by HRH Princess Royal, and the Seamaster of the Year award. She is a Fellow of the Royal Geographical society and in 2017 was elected as a member of the Cordon Rouge Club.